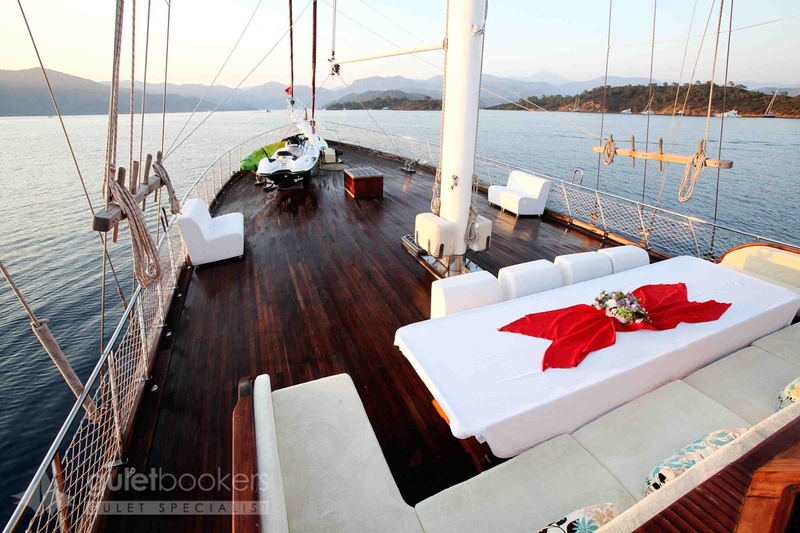 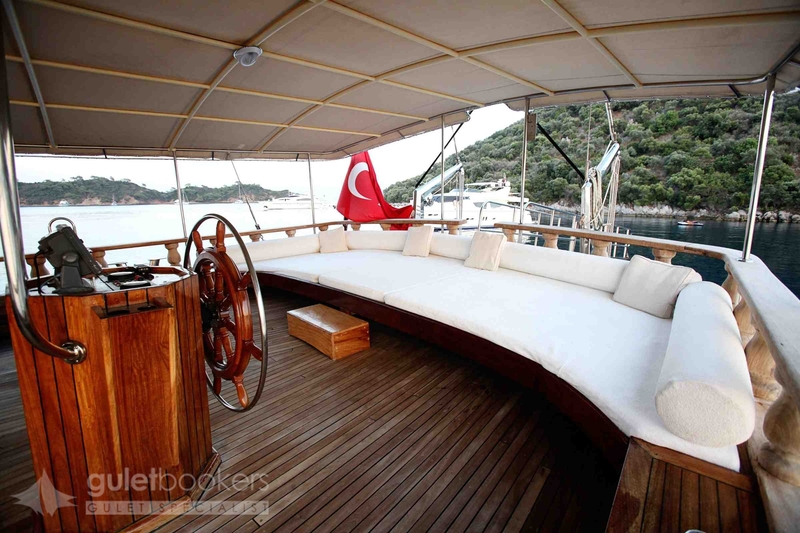 The generous 39m length of the elegant Luxury gulet Fortuna 2 sets it apart as one of the largest gulets along the Turkish coast which offers up to sixteen guests ample space to enjoy their gulet cruise indoors and out on deck. 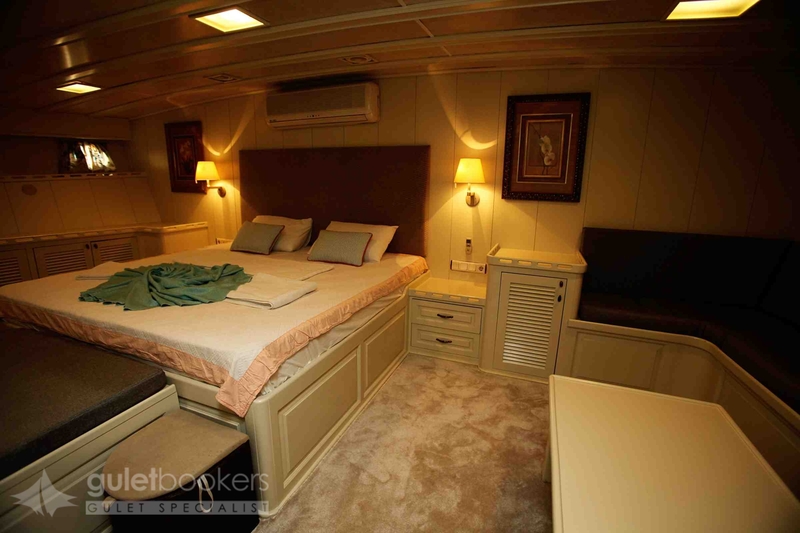 Two master cabins fore and aft enjoy the full beam width with space for walk-around queen size beds, side sofas, vanity and storage and en-suite bathrooms. 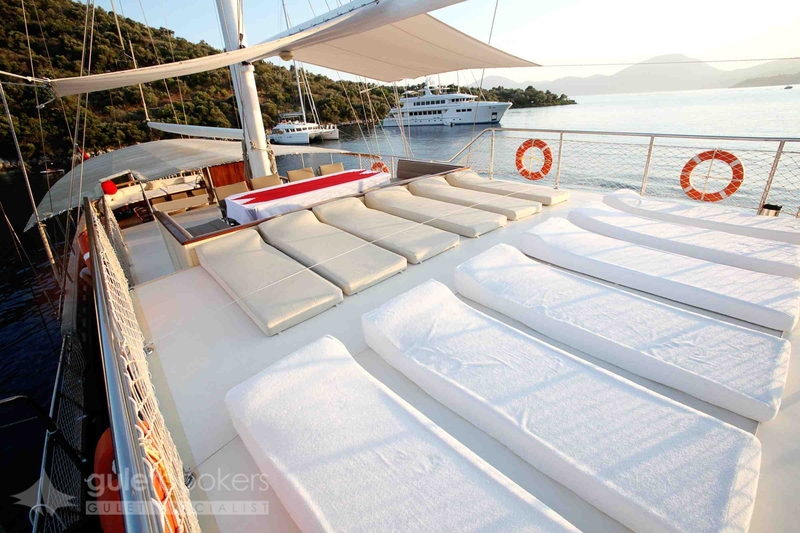 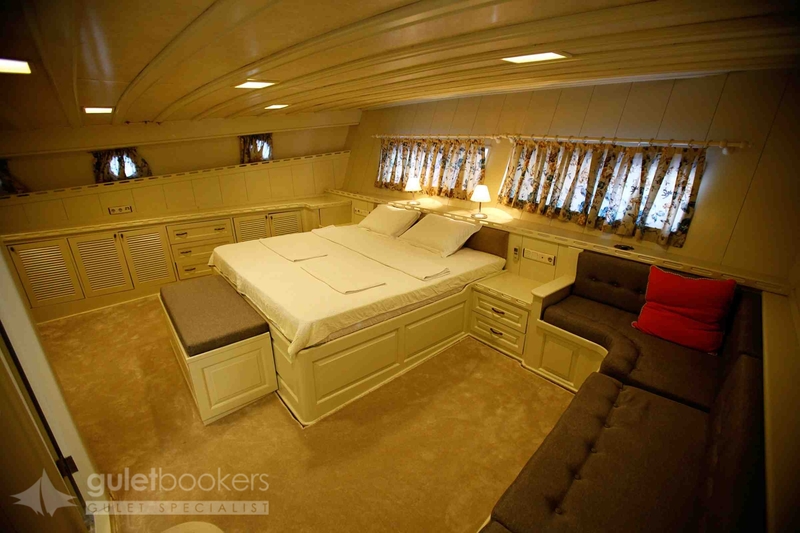 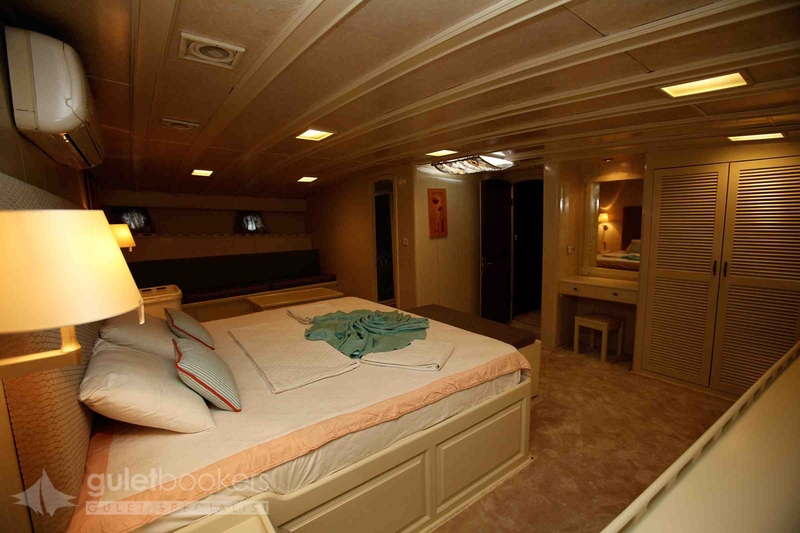 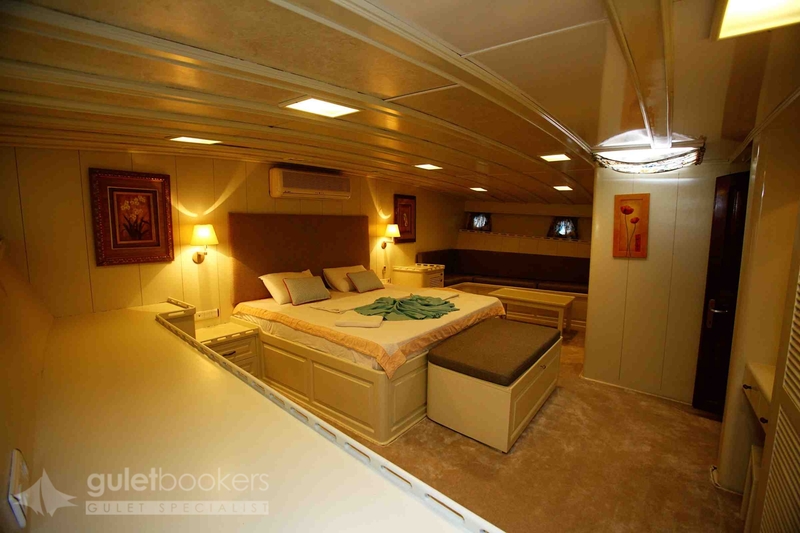 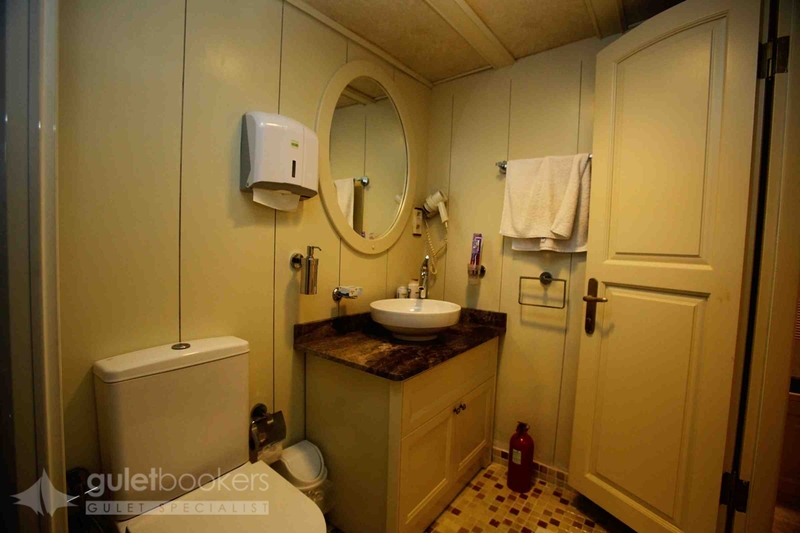 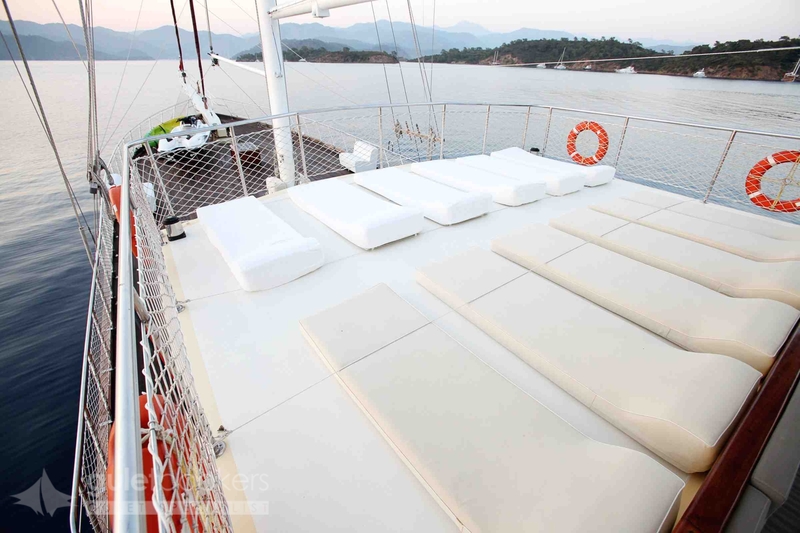 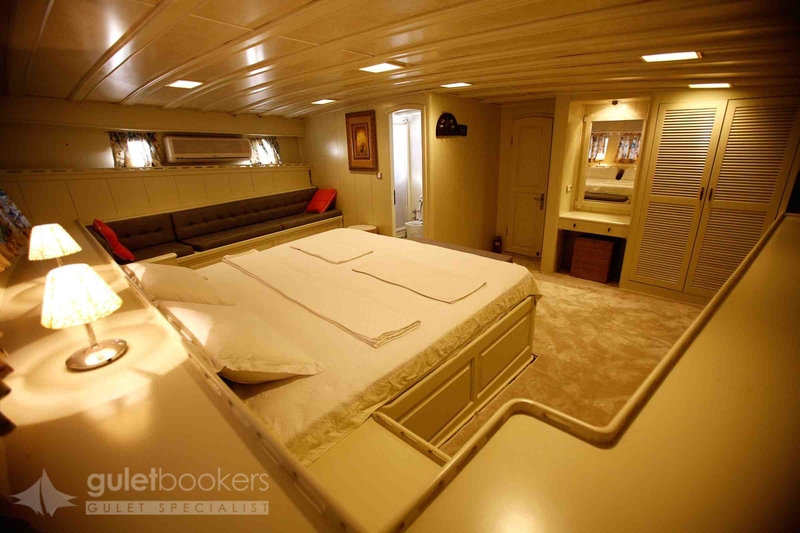 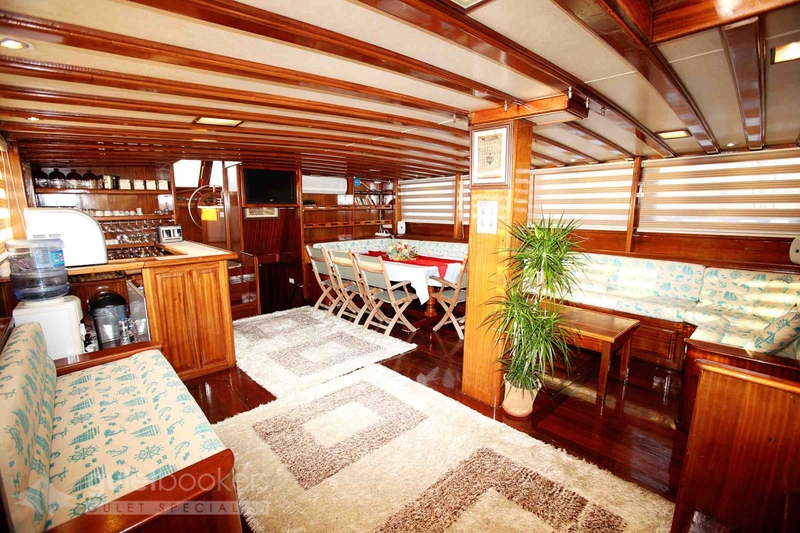 The four double bed cabins and two twin cabins on luxury gulet yacht Fortuna II are arranged fore and aft of the large indoor saloon which has space for indoor dining, and sofa benches for relaxation and enjoying the entertainment options of TV, DVD and music systems and internet connection. 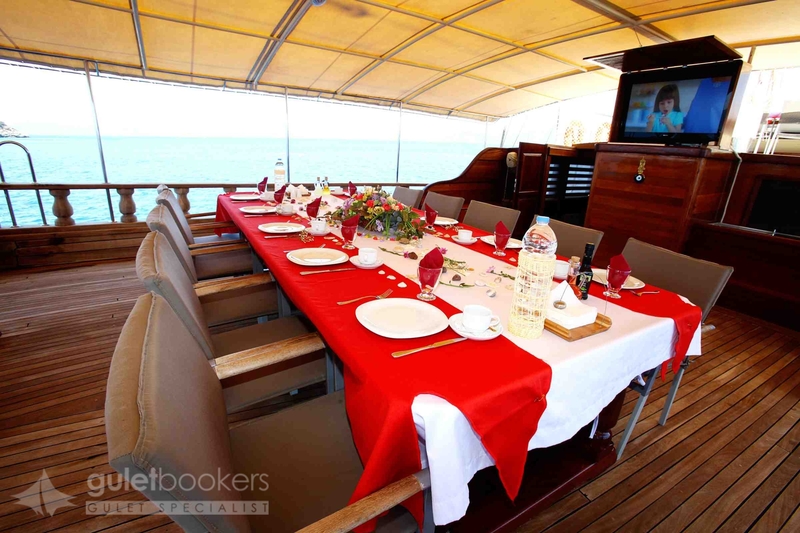 A large TV is also available for use for guests seated at the outdoor aft deck dining table which will seat all guests comfortably. 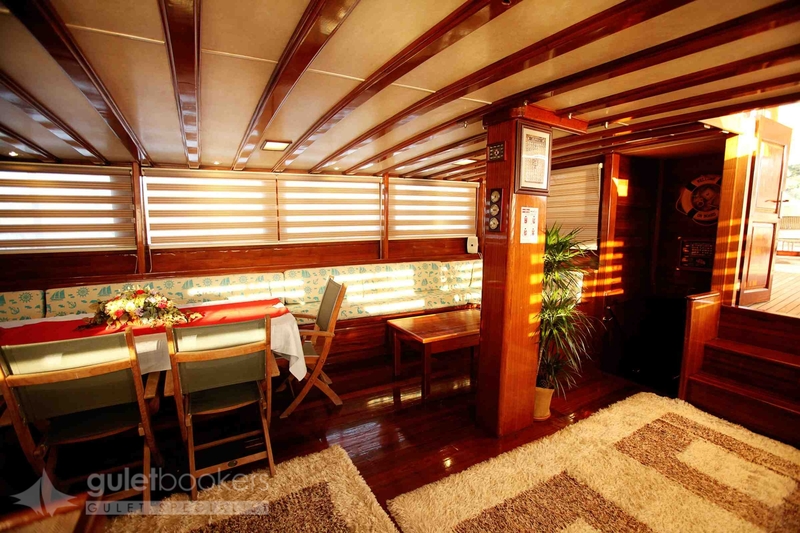 There they may enjoy the delicious meals created daily in the fully-equipped galley by the cook, or they may choose to eat at the cabin-top dining table beside the full-length sunbeds or even on the forward deck where yet another dining table beckons for eating under the stars. 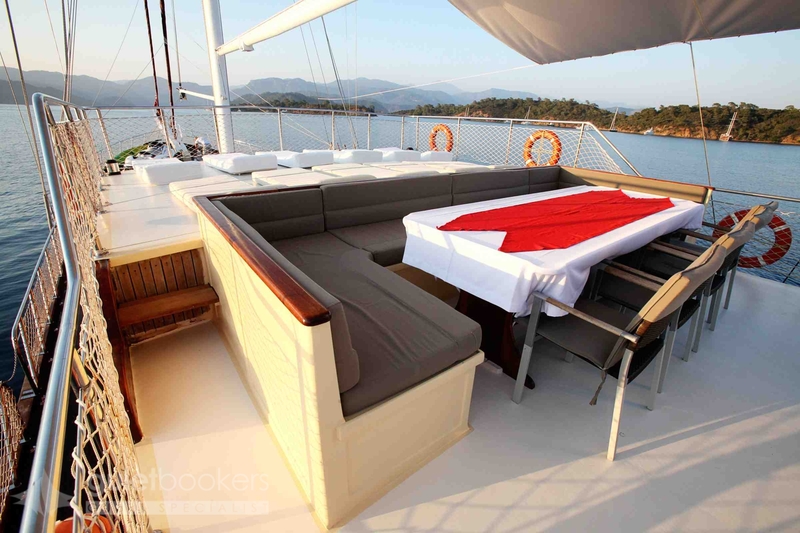 The generous cushion pads across the stern are almost full length and provide an inviting area for lazing under the shade of the fixed awning across the aft deck. 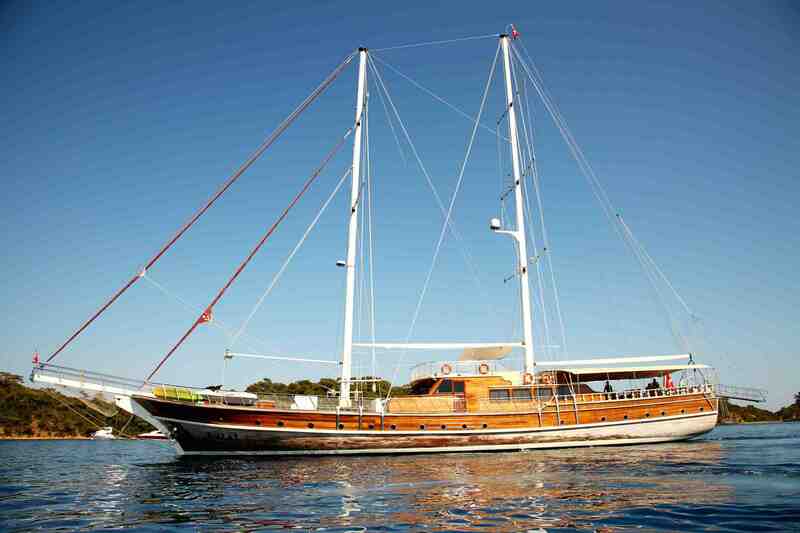 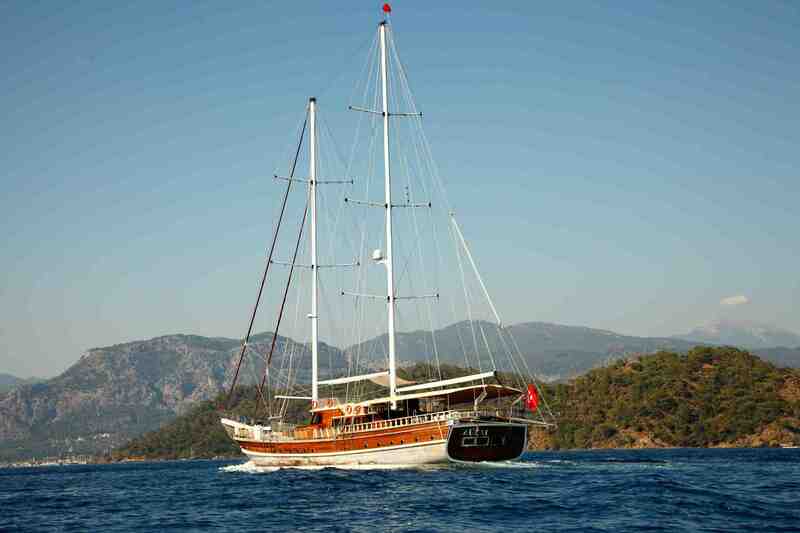 The experienced and professional crew of Fortuna II boat, will see to the guests’ meals and drinks service on board, the cleaning, navigation and even open up the some or all of the full set of sails to really add to the carefree experience of gulet cruising along the turquoise waters of the Turkish coast or into the Greek Islands of the Dodecanese.